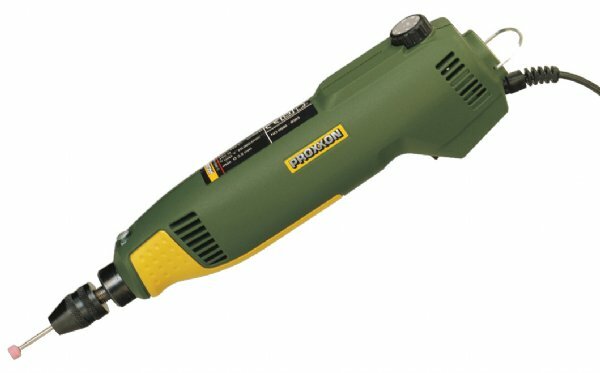 The Proxxon Hand-Held Precision Rotary Tool is a step up from the typical hardware store rotary tools available today. It has more power, a smaller body and a smoother running motor. A special motor technology with full range electronic speed control allows for powerful operation with constant torque even at low speeds. This feature is especially important when micro-drilling, brushing and polishing on delicate materials. The extremely balanced motor makes the tool run vibration-free with no overheating. The Proxxon soft-grip ergonomic design allows for comfortable use with the most optimal control. The spindle runs in a precision ball bearing and a button lock spindle for the easy changing of bits. The keyless precision chuck allows for the quick change of all accessories with shanks from 1/64" to 1/8". With so many uses, the Proxxon FBS 115/E will quickly become a must have for almost anything. It can be used for drilling, milling, grinding, polishing, brushing, deburring, derusting, engraving, carving and cutting.